Vancouver, BC - Skyharbour Resources Ltd. (TSX-V: SYH) (OTC Grey: SYHBF) (Frankfurt: SC1N) (the “Company”) is pleased to announce, that further to its news releases dated January 29, 2015 and February 10, 2015, it has closed its non-brokered private placement to raise gross proceeds of $1,250,263.50. Due to strong response from investors, the Company increased its non-brokered private placement financing to $1,250,263.50 from the initially targeted $500,000 as set out in the Company’s news release dated January 29, 2015. The amended financing will be completed through the issuance of up to 25,005,270 units (the “Units”) at a price of $0.05 per unit. Each Unit consists of one common share and one non-transferable share purchase warrant (“Warrant”), with each whole Warrant entitling the holder to purchase one common share for a period of five years at a price of $0.075 per share. In connection with the financing, Skyharbour issued a total of 197,855 finder’s warrants to finders (the “Finder’s Warrants”) who introduced certain subscribers to the private placement. The Finder’s Warrants are on the same terms as the Warrants. The Company also paid to finders a cash total of $9,892.75 in connection with this financing. The Unit Shares and Warrants issued under the private placement and any shares issued pursuant to the exercise of the Warrants and Finder’s Warrants are subject to a four month and one day hold period under applicable securities laws and imposed by the TSX Venture Exchange. Skyharbour intends to utilize the proceeds of this private placement for the continued exploration of the Company’s uranium projects in the Athabasca Basin and for general working capital purposes. 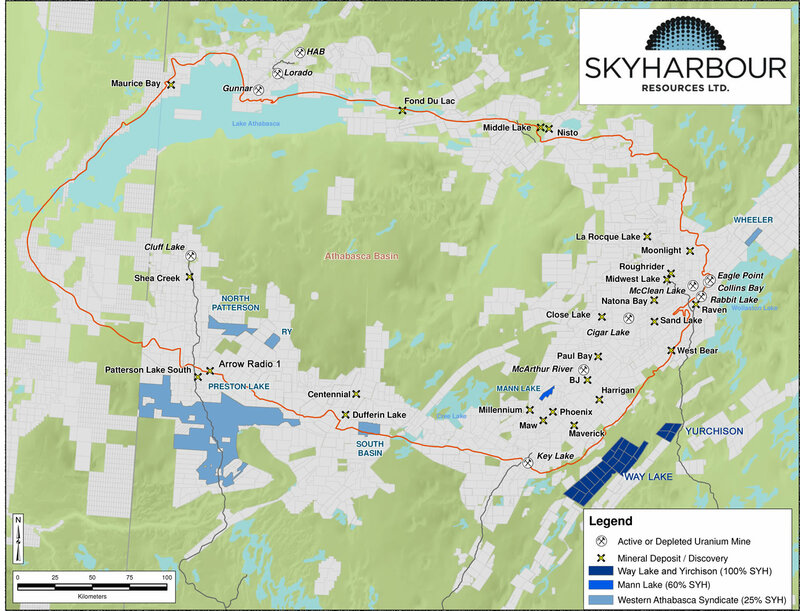 Skyharbour is planning a winter drill program at its 100% owned Falcon Point Uranium Project (previously the Way Lake Project) located 55 km east of the Key Lake Mill, which will be the Company’s first work program on the property since acquiring it from Denison Mines in the summer of 2014. The program will focus on diamond drilling high-priority targets including areas in and around the current uranium/thorium resource at the JNR Fraser Lakes target. Additionally, Skyharbour and the Western Athabasca Syndicate plan to commence a field program at the Preston Property in March that will consist of further exploration of high-priority targets, as well as geophysical and geochemical surveys to identify new targets. The 246,643 hectare Preston Uranium Property is the largest individual property proximal to Fission Uranium’s Triple R deposit and the recent discovery made by NexGen Energy on the Rook-1 Project. Skyharbour Resources Ltd. is a uranium and thorium exploration company and the operator of the Western Athabasca Syndicate which controls a large, geologically prospective land package consisting of five properties in the Athabasca Basin of Saskatchewan. Skyharbour also owns a 100% interest in the Falcon Point (formerly Way Lake) Uranium Project on the east side of the Basin which hosts an NI 43-101 compliant inferred resource totaling 7.0 million pounds of U3O8 at 0.03% and 5.3 million pounds of ThO2 at 0.023%. The Company owns a 60% interest in the Mann Lake Uranium project on the east side of the Basin strategically located 25 km southwest of Cameco’s McArthur River Mine. Skyharbour’s goal is to maximize shareholder value through new mineral discoveries, committed long-term partnerships, and the advancement of exploration projects in geopolitically favourable jurisdictions.